ICAR AIEEA 2019: Indian Council Of Agriculture Research organizes AIEEA (All India Entrance Examination) to rank candidates for admission in Bachelor, Masters & Ph.D. Programs in the field of Agriculture and Technology. Latest Update: ICAR AIEEA 2019 Registration Started for UG and PG Programs. Check the schedule below. Latest Update: ICAR AIEEA UG and PG exam will conduct on July 1, 2019. Check here complete details. ICAR AIEEA is a National Level Examination organized under Government Body called Ministry Of Agriculture and Farmers Welfare which runs the ICAR. ICAR AIEEA Application Form and exam also provides you with great opportunities in scholarship, for example, National Talent Scholarship which is awarded only if you get top ranks in the Merit List. On the basis of this year’s ICAR AIEEA Schedule, we are providing the tentative dates of ICAR AIEEA 2019. This table with all the dates will be updated when the official dates will be announced. Timing of Examination 09:30 p.m. to 12:00 Noon. ***As per the OM No. 20013/01/2018-BC-II dated January 17, 2019 issued by the Ministry of Social Justice and Empowerment and the OM No. 12-4/2019-U1 dated 17.01.2019 as well as the Letters No 35-2/2019-T.S.I dated 21.01.2019, 01.02.2019, 04.02.2019 and 15.02.2019 of MHRD Department of Higher Education regarding implementation of reservation for Economically Weaker Sections (EWSs) for admission in Central Educational Institutions. It is very important for candidates to meet the eligibility criteria to get admission in various programs. There are different eligibility criteria for different degrees. The candidate must be Indian in Nationality. The Minimum age required to apply for this course is 16 years. The candidate must have completed 10+2 from any recognized board. She/he should have Physics, Chemistry compulsory with any one of the Mathematics/Biology/Agriculture. The applicant who wants subject from Stream A should have Physics, Chemistry with Biology/Agriculture to apply for ICAR AIEEA 2019 Eligibility Criteria. The applicant who wants subject from Stream B should have Physics , Chemistry with Mathematics. The Minimum Marks required for the qualifying exams are 50% for Gen, OBC & UPC whereas 40% Marks for the SC, ST, and PC. Both Appearing candidates and those who already appeared last year in qualifying exam are eligible to apply. The Minimum age required to apply for this course is 19 years. The candidate must have completed valid bachelor degree from any recognized University in related field. The Minimum Percentage required in graduation to apply for ICAR AIEEA Eligibility Criteria is for Gen, OBC and UPC is 60% whereas for SC, ST and Pc is 50%. The applicants who are in final year of the under graduation can also apply. The Application Form will be available online in the month of May. Candidates have to visit the official website to register them for the exam. After registration, they will have to provide all the required/ asked details. The complete procedure is given below. Applicant should go to the official website. Once you are on the website find the news or notice section where you can find the link for the Registration where you have to submit details like name, mobile number, email id, parents name, and password. Start filling the Application form which requires your education qualification, contact details, upload passport size photo with specific dimensions, upload signature and thumb biometric and other required documents. Cross verify all the details that you have entered in the form to check all details are correct. Now move to the payment gateway and pay the required fees according to the category. There are two options namely, Net banking with Credit/Debit Card or with Bank Challan according to your convince. In case you are paying through Bank Challan and enter the appropriate details. You have to send one Bank Challan copy through Speed post to the official address of the organization ICAR i.e. Officer Controller Of Examination(ICAR), Room Number – 216, Krishi Anusandhan Bhavan-II, Pusa, New Delhi,110012. 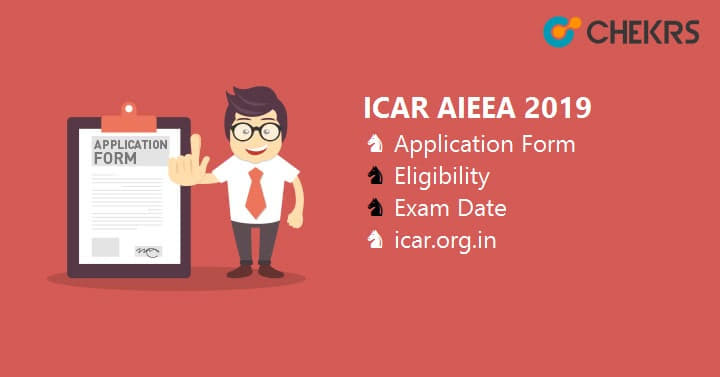 In the end, submit the final page and see the confirmation for ICAR AIEEA Registration Form 2019. You should take the print out of the form and Fee receipt for future Reference. Will the Exam Dates be Different for UG, PG and Phd Program? Yes, There will be difference in Exam dates, but not much.
. ICAR AIEEA Registration Fee will be in Between Rs. 250 to 1200. It depends on Category and Exam. You can get full detail just below, in the fee table. How much percentage required in graduation to be eligible for ICAR AIEEA? Is there any Age Criteria for ICAR AIEEA? Yes. For UG, Minimum age required to apply is 16 years, Whereas for PG it is 19 Years. The ICAR AIEEA exam paper will consist 180 Objective Type questions in both the Streams A or B. The time duration for the exam will be 2 hours 30 minutes. All the Other details are given below. In case of any language related disparity or ambiguity English version of the question would be considered as final. Note: The candidates are advised not to attempt such questions, for which they are not sure of the correct answer. First 20 MCQs are common to all 16 major subjects. The questions assess the level of candidate’s awareness about the environment and its application to the society. The questions are based on general knowledge in the domain of Agriculture, Animal Husbandry, Dairying, Fisheries and Allied Sciences, etc. including current events and matters of everyday observation and experience. Remaining 180 MCQs belong to Major Subject Group, as applicable; and are based on the syllabus of different sub-subjects listed under that Major Subject Group. The ICAR AIEEA Syllabus is not same for both streams. The ICAR AIEEA Syllabus 2019 for Stream-A consist of following subjects Physics, Chemistry, and Agriculture or Biology, whereas the other Stream B has Physics, Chemistry with Mathematics. Applicant must cover all the topics of the above subject in order to get good rank in ICAR AIEEA. The admit card will be available on the Official website of the ICAR for those who have successfully filled and submitted their Application for 2019. Once you have downloaded ICAR AIEEA Admit Card paste your recent photo on it and sign it. The ICAR AIEEA Result 2019 will be available in the news section of the official website in a gap of a month. On the basis of the result, a separate category wise ICAR AIEEA Merit List will be released online, on the official Website. The Rank List will also contain the time and place where they have to appear for the counselling. After the result Counselling will be the next step to get admission in the preferred course and institute. On the basis of the result, a category wise ICAR AIEEA Rank List will be prepared and released online, on the official Website. The Rank List will also contain the time and place where they have to appear for the counselling. ICAR AIEEA Counselling Fee is Rs. 2000/-. In the counselling procedure candidates have to fill their preferred choice and other details. On the basis of Filled choice, Seat availability, and reservation, the seat will be allotted to all the eligible candidates. After Seat Allotment Candidates have to report to the college for the admission and document verification process.